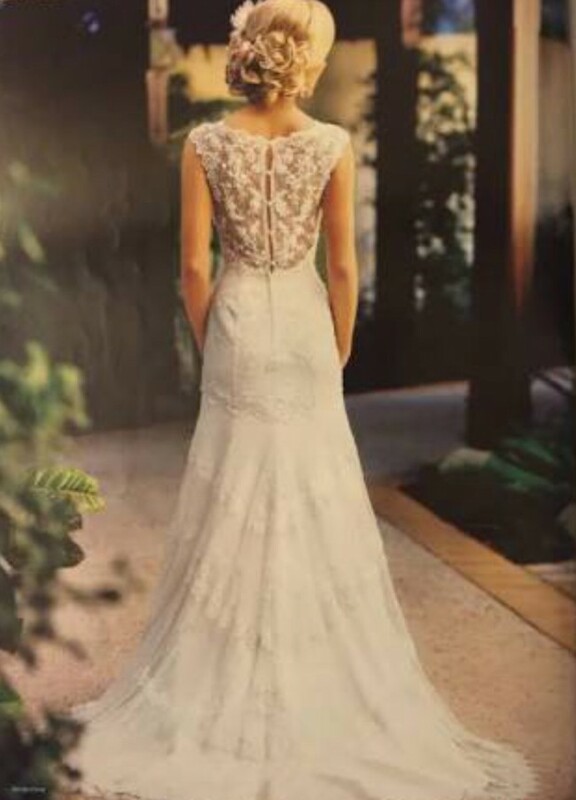 Stunning ivory Bella Donna (by Wendy Makin) wedding gown. Elegant vintage style floor-length gown embellished with soft lace, pearls, seed beads and tiny clear sequins. The gown features a flattering fit and flare shaped a-line silhouette, sweetheart neckline, natural waist, cap sleeves, open sheer lace button-up back and a small court length train. The back fastens with a zip, hook and lace-covered buttons. The dress is very light and was extremely comfortable. There is no damage to the dress. Veil also available $50. It’s the perfect dress to make a perfect day! The length was shortened slightly along with the bust to fit 10C, also included the addition of a strong bustle hook for the train.